Be a member of the call queue to which the call is routed. What happens when I am offered a call? If the application is open, the Phone tab blinks red, indicating an inbound interaction. Click to answer the phone, the end-user record opens in a browser tab, even if the Virtual Contact Center floater window is closed. What is a typical inbound call flow? When a call is offered, the phone tab blinks red. 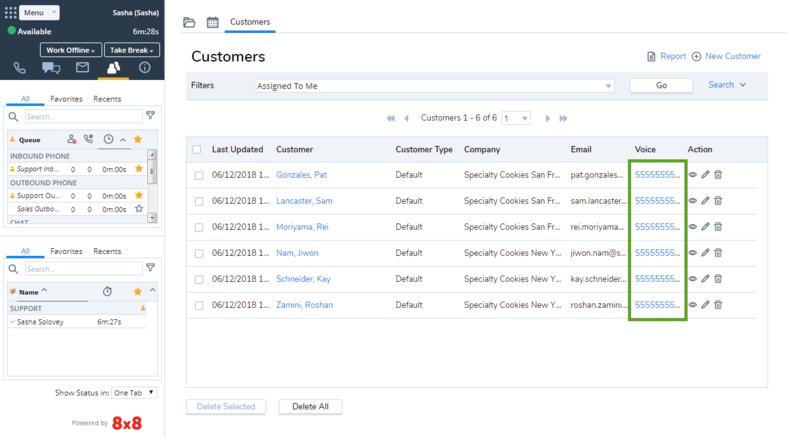 If the caller is an existing customer, the end-user record opens in a browser tab, allowing you to preview the customer details and prepare to greet accordingly. After processing the call, end the call. The post-processing time initiates. This is your time to wrap up notes for the call. If applicable, click End Post Processing, or wait for the call to terminate. At the termination of the call, a call log is automatically generated and pops in a new browser tab. The call log typically includes information on the transaction ID, call initiation time, call termination time, call duration, and more. Mark the log complete by indicating the caller name and agent’s name. Click Work Offline if you need more time to complete any post-processing tasks or add notes. What is the screen pop behavior for a phone call? 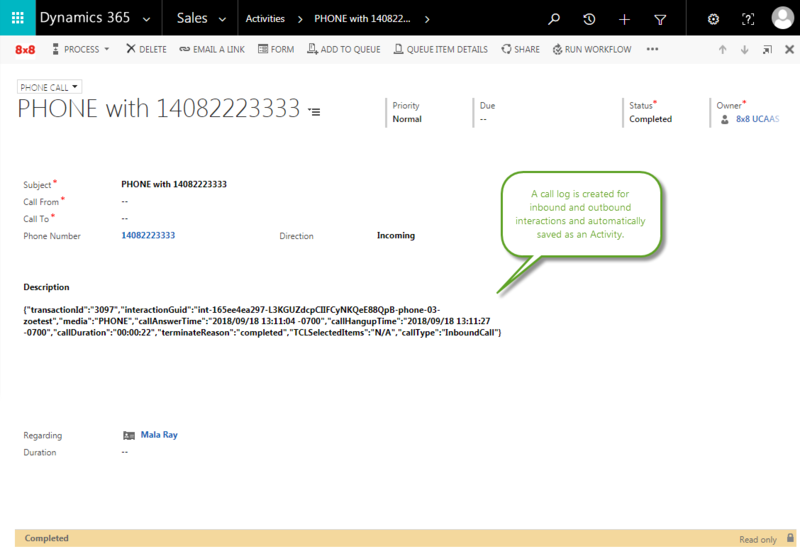 During an inbound call, the 8x8 Contact Center application looks up the phone number of the caller and then searches for a matching record in the CRM. On finding a matching record, it presents the record for you to preview and prepare for the call. This process is referred to as screen pop. A single match: The matching record is presented in a new browser tab. Multiple matches: In the event of multiple matching contacts, the app lists all matches in the Search tab. Click next to the desired record to view the details. No match: In the absence of matching records, a call log is created. What is the call log behavior? Upon terminating a call, the 8x8 Contact Center app generates a call log. The call log includes information such as transaction ID, the time the call was answered, and the duration of the call. A call log is created for inbound and outbound interactions and automatically saved as an Activity. You can change the status of the activity to complete or any desired state. Single match: If there is a matching record, the call log is created and associated as an activity to the record. Multiple matches: In the event of multiple matching contacts, there will be no screen pop. The call log is created and associated as an activity to the first record in the list. No match: In the absence of a matching record, a message indicates the lack of a matching record. The call is logged. How to place outbound calls? Control Panel: Ability to dial outbound calls from the control panel by simply entering the desired number in the Phone tab and clicking Dial. How do I place calls using control panel? 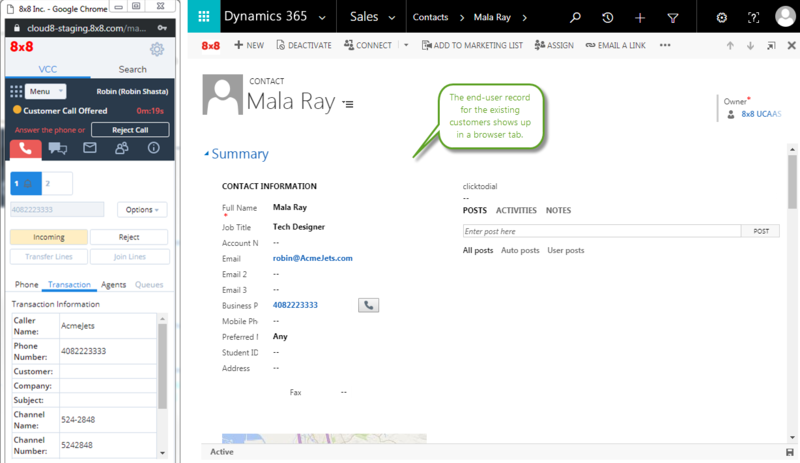 Enter a customer phone number under the Phone tab in the 8x8 Contact Center and click Dial. Your agent telephone rings first. Answer the call. The call is then directed to the destination. Your external phone number rings next. If the phone number is linked to a contact, the contact record pops after the call connects. Contact your supervisor for your contact center's policies to place outbound calls. Click-to-dial: Ability to click and dial the phone numbers from end-user records. How do I place calls using click-to-dial? 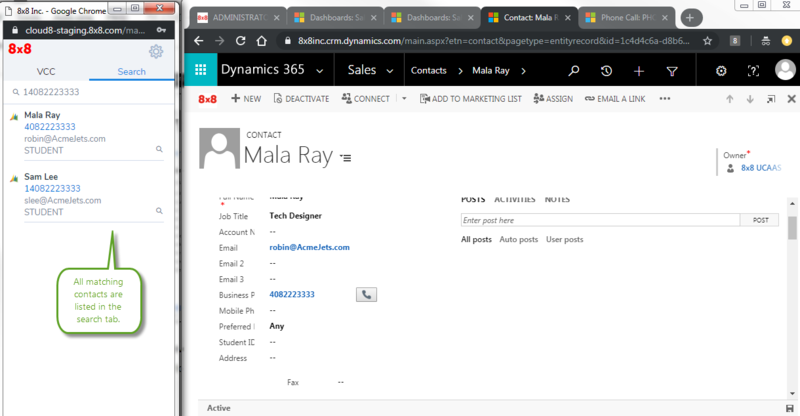 If configured by your administrator, you are able to click and dial phone numbers from records in Microsoft Dynamics CRM. If your contact center administrator has set up phone codes, you have to select the appropriate codes to apply the right calling line ID to your outbound calls. The outbound phone code list shows.